Coxiella, Ehrlichia, and Rickettsia spp. are small, obligate intracellular bacteria that usually cause disease when they accidentally encounter a human host. Once inside a host cell, Coxiella and Ehrlichia spp. remain within a vacuole where they progress through distinct developmental stages; in contrast, the Rickettsia spp. escape the endocytic vacuole and replicate within the host cell cytoplasm. 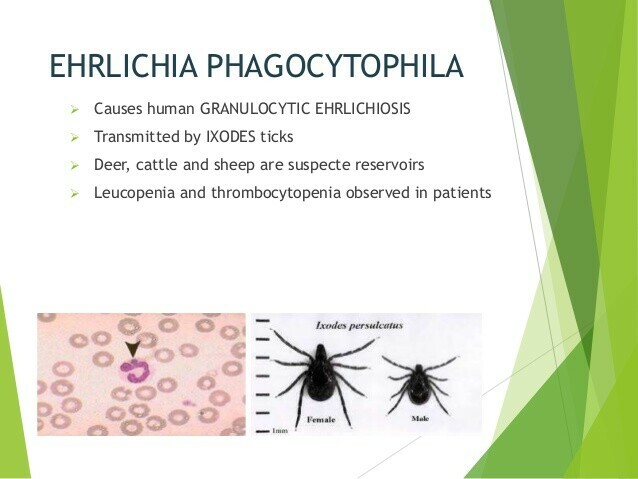 Ehrlichia and Rickettsia spp. are transmitted by arthropod vectors. Key symptoms and signs: fever, severe headache, myalgias, arthralgias, retrobulbar pain, cough; possible pneumonitis and hepatitis on examination. Predisposing factors: occupation as a dairy farmer, abattoir worker, or veterinarian; exposure to parturient or newborn animals, particularly cattle, sheep, and goats. Commonest environment for infection: a rural setting, but urban cases of Q fever also reported. Commonest infections: acute febrile illness, pneumonitis, and hepatitis. Key laboratory feature: positive antibodies to the phase-II antigens. Key symptoms and signs: fever and heart murmur. Predisposing factors: same as those for acute disease, plus prosthetic or abnormal heart valves. Commonest features: fever and endocarditis; echocardiogram rarely positive. Key laboratory features: levels of antibodies to phase-I antigens in excess of phase-II antigens. Coxiella burnetii is the causative agent of Query or Q fever. This disease name originated with the description of a 1935 outbreak of a febrile illness of unknown etiology in nine abattoir workers in Brisbane, Australia. The disease agent, based on its morphology and obligate intracellular lifestyle, was originally classified as a member of the family Rickettsiaceae. However, molecular analysis and in particular ribosomal-DNA sequencing have revealed the relationships between C burnetii and the Legionella spp. within the gamma subdivision of the Proteobacteria, and its more distant relationships to the rickettsia and the alpha subdivision of Proteobacteria. A. Epidemiology. Cattle, sheep, and goats are the primary reservoirs for C burnetii, although the organism is found in a wide variety of domesticated animals. Inhalation of aerosolized organisms and ingestion of unpasteurized milk or cheese are common mechanisms of transmission to humans. Infection of domestic livestock usually occurs via the aerosol route and fails to cause clinically apparent or significant disease. Persistence of C burnetii in a latent phase in a host may be followed years later by reactivation and disease, especially during the late stages of pregnancy, because the organism exhibits tropism for the placenta. Many cases of human Q fever occur as a result of close association with animals at the time of parturition or soon thereafter, particularly sheep, cattle, cats, rabbits, and dogs. 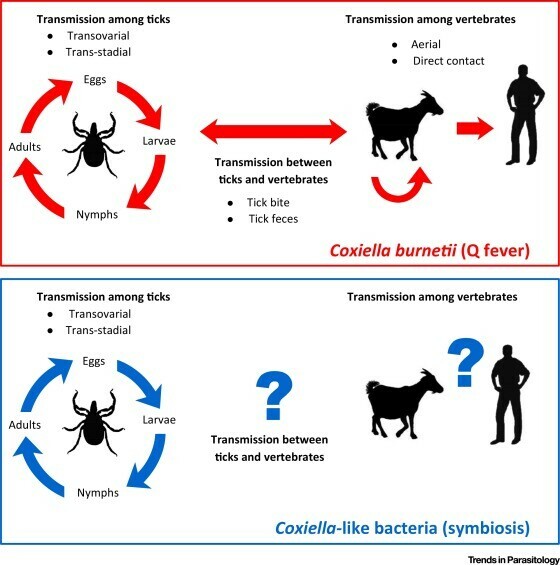 Ticks can also serve as transmission vehicles for C burnetii, but this mechanism is primarily involved in transmission of the organism to animals rather than humans. Humans at risk for disease include dairy farmers and slaughterhouse and laboratory workers. Q fever is endemic throughout the world, except in New Zealand, but it is particularly common in the Middle East and Mediterranean regions. Although seemingly uncommon in the United States, Q fever is believed to be grossly underdiagnosed owing to its protean manifestations and to low clinical suspicion of Q fever as a probable disease; 70% of cases are reported from California and the western mountain states. Urban transmission has been described and is thought to result from close association with parturient animals. B. Microbiology. C burnetii is a short, pleomorphic gram-negative rod and an obligate intracellular pathogen. C. Pathogenesis. C burnetii enters cells, allows the endocytic vacuole to fuse with lysosomes, multiplies within the acidic environment of the resulting phagolysosome, and ultimately destroys the host cell. Although the exact mechanisms by which C burnetii survives within the phagolysosome are unclear, it does require an acid environment at that point in its life cycle; in fact, pharmacologic strategies to block acidification of intracellular vacuoles, for example using chloroquine, are therapeutic (see Treatment section below). C burnetii also has the ability to form sporelike structures, enabling it to survive diverse environmental conditions. The organism exists in either of two antigenic phases (I or II), owing to variation in the expression of different membrane lipopolysaccharides and proteins. Fresh isolates exhibiting phase-I antigens are highly infectious. Conversion to phase II occurs after serial passage in the laboratory, although reversion to phase-I antigen occurs with passage through laboratory animals. The immune response to these phase-associated antigens is useful in the diagnosis of C burnetii infections. Antibodies to phase-II antigen are found in the blood of patients with acute disease, whereas antibodies to phase-I antigen are more often detected in patients with chronic disease, such as endocarditis. The virulence-associated mechanisms of this organism are poorly understood. Tissues affected by Q fever reveal vascular injury and granulomatous inflammation along with hemorrhage and necrosis. Q fever is one of many causes of granulomatous hepatitis. A. Acute infection. Seroepidemiologic studies indicate that ~ 50% of “cases” of Q fever in humans are asymptomatic. Symptomatic cases usually present with an acute febrile illness. Disease manifestations include a flulike illness, isolated fever, pneumonitis, hepatitis, exanthema with fever, pericarditis, myocarditis, and meningoencephalitis (Box 1). Most important in the diagnosis of acute Q fever is a history of contact with a newborn or parturient animal, which is found in two-thirds of all cases. There is marked geographic variation with respect to the clinical features of disease presentation; eg, hepatitis is seen more commonly in France than in Nova Scotia, and pneumonitis is more common in Nova Scotia than in France. The route of transmission does not seem to be a major factor in determining disease presentation. The incubation period of Q fever ranges from 4 to 39 days, with an average of 14 days. Patients frequently present with an acute onset of fever >38.5°C, rigors, and a severe headache. Other symptoms may include retrobulbar pain, malaise, myalgias, arthralgias, neck stiffness, nausea, vomiting, cough, pleuritic chest pain, diarrhea, and jaundice. Hepatosplenomegaly may be found on examination, and a maculopapular rash is present in 20% of cases. Hepatic involvement may range from mild subclinical elevations of hepatic transaminase levels to marked enzyme and bilirubin elevations accompanied by typical clinical features of hepatitis. A patchy interstitial infiltrate, as seen with other causes of “atypical” pneumonia such as Mycoplasma pneumoniae, is often found on chest radiograph. The leukocyte count is usually normal, but thrombocytopenia may be seen on 25% of cases. The illness is usually self-limited and lasts 2-4 weeks. B. Chronic Infection. Approximately 2% to 11% of patients with Q fever progress to a chronic infection, of which endocarditis accounts for 60-70% of cases. Q fever endocarditis develops almost exclusively in patients with previous valvular heart disease, in transplant recipients, and in patients with underlying immunosuppression. Aortic and prosthetic valves are most commonly involved. Vegetation is rarely seen on echocardiogram, and routine blood cultures are negative. A clue to the diagnosis of Q fever endocarditis is the finding of a systemic inflammatory syndrome or unexplained accelerated valve failure in a patient with a history of valvular heart disease. Manifestations of this disease may include hepatosplenomegaly, a purpuric rash, renal insufficiency, and embolic phenomena. Laboratory findings include leukocytosis (25% of patients), leukopenia (15%), increased hepatic transaminase levels (40-60%), thrombocytopenia (25-50%), anemia (40%), increased creatinine levels (65%), antinuclear antibodies (35%), and rheumatoid factor (60%). Another common presentation of chronic Q fever is fever of unknown origin. Bone and joint involvement due to Q fever are uncommon, but they have been reported in both children and adults. Chronic hepatitis is another uncommon manifestation of Q fever. The diagnosis of Q fever is based on an appropriate clinical history, along with a clear or possible history of animal exposure. The bacteria can be cultured from the blood, urine, and sputum by inoculation into chicken embryos or cultured human fibroblasts, but this procedure requires a specialized laboratory. In addition, the risk of transmission to laboratory workers is high; therefore, it should only be attempted in laboratories with considerable experience in handling this organism. The routine approach for the diagnosis of Q fever is a serological one, with detection of antibody to phase-I and -II antigens. Complement fixation, indirect fluorescent antibody (IFA), and enzyme-linked immunosorbent assays are available. Acute Q fever is diagnosed by a fourfold or greater increase in levels of antibodies directed against the C burnetii phase-II antigens. Titers become positive by 8-14 days after onset of the illness and peak at 4-8 weeks using IFA testing or at 12-13 weeks using complement fixation testing. Chronic disease, eg, endocarditis, is diagnosed by detecting levels of antibodies to C burnetii phase-I antigens in excess of levels of antibodies directed against the phase-II antigens. A complement fixation antibody titer against the phase-I antigens of >1:200 is considered also diagnostic. Acute Q fever is usually self-limited. However, antimicrobial agents are recommended to prevent the development of chronic infection and possibly to decrease the duration of symptoms (Box 2). Doxycycline is effective, provided that it is started early in the disease. Quinolones, because of their cerebrospinal fluid penetration, should be considered for the treatment of meningoencephalitis. Treatment of chronic Q fever has never been studied in a controlled setting. Recommended regimens include rifampicin or ciprofloxacin plus doxycycline (Box 3). The duration of therapy necessary for a cure is also unknown, but =12 months is required, and some experts recommend a minimum of 3 years. In many cases, lifelong treatment may be necessary. Current studies are assessing the use of hydroxychloroquine in conjunction with doxycycline and/or ciprofloxacin, since blockade of intracellular acidification with the former improves the bactericidal activity of the latter for C burnetii in vitro. There is no currently available vaccine for the prevention of Q fever. Procedures should be in place to protect laboratory workers from being exposed to the organism and patients with the disease should be placed in standard-precaution isolation. The Rickettsia species are small, pleomorphic coccobacilli and obligate intracellular pathogens that depend on the host as a source of energy. Humans are only accidental hosts for these organisms and are usually infected by means of an arthropod vector. 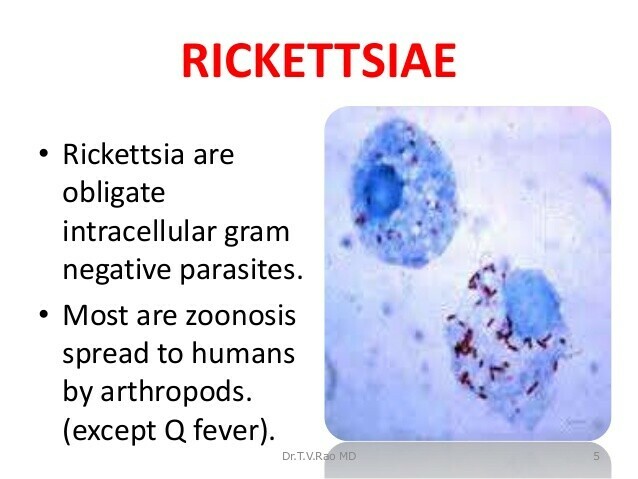 Rickettsia multiply at the bite site, invade the bloodstream, and establish infection by infecting endothelial cells throughout the microvasculature. Subsequent vascular lesions caused by damage to endothelial cells accounts for the pathologic changes that occur throughout the body. This damage is most marked in RMSF. Other spotted fevers include Mediterranean spotted fever, South African tick bite fever, Siberian tick typhus, Queensland tick typhus, and Oriental spotted fever. All of these rickettsioses are associated with an eschar and regional adenopathy. A generalized maculopapular rash involving the palms and soles usually appears about 5 days into the illness. Fever lasts ~5 to 10 days if untreated. Diagnosis is based on epidemiology, clinical features including the presence of an eschar, and serology. Treatment with doxycycline is effective. The organism principally responsible for endemic or murine typhus is Rickettsia typhi. More recently, Rickettsia felis has been characterized as a cause of endemic typhus in southern California and Texas. Transmission of these organisms to humans occurs via the flea. Clinical features include fever, headache, myalgias, and a maculopapular rash. Infected rats and opossums are the reservoirs for R typhi and R felis. The disease is endemic in the Southeast and Gulf states of the United States, especially Texas, and in southern California. During feeding on humans, when normal hosts are not available, the fleas deposit feces containing rickettsias. Humans become infected when the organisms are rubbed into the bite wound. The incubation period for endemic typhus is 6-14 days. Initial symptoms include headache, malaise, backache, and chills. Severe shaking chills, fever, and a more severe headache soon follow. Symptoms last for 10-14 days if untreated. The rash appears at about the fifth day and comprises pink macules starting on the extremities, which then spread to the trunk but do not involve the palms and soles. The rash may become maculopapular but is not hemorrhagic, and in fact it is not seen at all in 20-46% of cases. Pulmonary manifestations are common, particularly a nonproductive cough. Although many patients will have a severe headache, analysis of cerebrospinal fluid is usually normal. Complement-fixing antibodies are important in making the diagnosis. Treatment with tetracycline, doxycycline, or chloramphenicol usually resolves symptoms within 24-48 h. Prevention of endemic typhus involves reduction of the rodent reservoir and control of the flea vector. The etiologic agent of epidemic typhus is Rickettsia prowazekii. Epidemic typhus is a severe acute disease characterized by high fever, intense headache, a macular skin rash, and diffuse vascular lesions. Although this organism was responsible for the deaths of millions of people during World Wars I and II, the disease is now most commonly reported from northeastern and central Africa. A large proportion of the population is usually louse infested before epidemic typhus occurs. An infected louse deposits infected feces at the feeding site. Scratching then distributes the organism into the broken skin. Typhus is spread from human to human only via the body louse. In the eastern United States, cases of R prowazekii infection have been reported in patients with no history of lice infestation. These patients all described contact with flying squirrels or their nests. Epidemic typhus is far more severe than endemic typhus. After 7 days of incubation, patients develop sudden onset of severe headache, prostration, and high fever. A rash, appearing on the fifth day, consists of pink macules and is most common in the axillae. It occurs in 50-90% of patients. The rash coalesces, becomes petechial, and spreads to the trunk but usually does not involve the palms or soles. Conjunctival involvement is common. The disease is similar to RMSF, but the character and evolution of the rash, as well as the epidemiologic setting, distinguish the two diseases. An IFA test is the most sensitive and practical approach for diagnosing epidemic typhus. Chloramphenicol and tetracycline are effective therapies; patients usually become afebrile within 48 h. Relapse is rare if treatment is started early. A single 100-mg dose of doxycycline has also resulted in successful resolution of symptoms. Prevention requires mass delousing of the population at risk with permethrin or lindane. Orientia tsutsugamushi causes scrub typhus; it is transmitted by the bite of an infected mite. The disease is found in Southeast Asia, India, and northeastern Australia. Symptoms and signs of disease consist of an eschar at the bite site, regional and then generalized adenopathy, high fever, and a macular rash on the trunk, which appears after 5 days. The rash becomes maculopapular as it spreads to the extremities. Serology is the most practical diagnostic approach. Chloramphenicol and doxycycline are the therapeutic agents of choice, with rapid resolution of symptoms after the onset of therapy. A recent report of doxycycline-resistant scrub typhus in northern Thailand was the first to describe drug resistance in a rickettsial organism. Doxycycline, 100 mg twice daily for children over 100 lb. ; 2 mg/lb., divided twice daily in children < 100 lb.